HTC Desire 601 was rumored and speculated from as back as July this year. This successor of HTC Desire 600 was named HTC Zara and with the official announcement, all the rumored specifications have turned out to be true. This phone will be available for purchase next month and we expect it to come to India soon as a mid range device. This phone has a 5 MP camera which is expected to have 1.4 µm pixels like HTC desire 600, though this has not been officially specified yet. This is less than the much publicized Ultrapixel in High end HTC phones with 2 µm Pixel but is still more than the usual 1 µm pixel. Large size pixels provide with better low light performance as they capture more light. The size of the sensor is 1/4 inch and it has a wide F/2.0 aperture. This camera is also equipped with HTC ImageChip for image processing. It will also sport features like Sequence shot, Always Smile, Object Removal and VideoPic which we saw in HTC ONE. Overall the camera won’t be as effective as HTC ONE but will be a tough competitor amongst mid range devices. You can shoot full HD videos with the primary camera. A front VGA camera is also present in this device which is a mismatch with the rear camera. Internal storage is 8 GB and can be further extended to 32 GB using MicroSD card. 16 GB internal storage would have been more enticing at this price range but 8 GB will suffice for most users. The processor is faster than the predecessor HTC Desire 600. This phone is powered by a dual core Qualcomm Snapdragon 400 clocked at 1.4GHz. This processor will be backed by 1 GB of RAM to ensure smooth multi tasking and UI transitions. The battery capacity has been increased from 1860 in HTC Desire 600 to 2000 mAh in this new phone. This battery is non removable which many don’t find to be a convenient option. This battery will easily carry you through the day and is expected to give you a 2G talk time of more than 10 hrs. This phone comes with a 4.5 inch SLCD 3 Display with qHD resolution of 540 x960 pixels. SLCD will provide with enhanced brightness and outdoor visibility because it eliminates air layer from display and reduce refracted light. you will get a pixel density of 245 ppi which is well above average and a good clarity display. This phone has only Single SIM functionality and comes with various added features like HTC ZOE which captures short 3 sec video clips along with still shots, dual front facing BoomSound speaker similar to HTC ONE. This phone has Android 4.2 jelly bean as its operating system and will feature HTC Sense 5 UI on top of it. 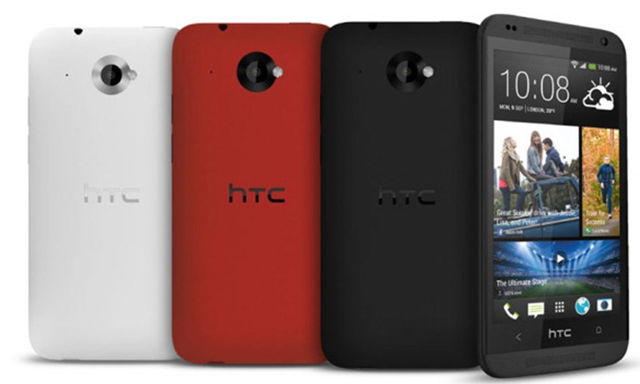 This phone comes in 3 colors Red, White and Black. The plastic body looks quite premium and the back panel feature the shaded rim around camera sensor which encompasses LED Flash as well. As far as looks go this phone is quite attractive and is 9.8 mm thick. This phone offers LTE and HSPA+ 42Mbps connectivity along with other connectivity features like GPRS, WiFi, 3.5 mm Audio jack, Etc. We expect this phone to be priced around 27,000 to 28,000 INR and at this price range it will compete with phones like Samsung Galaxy S3, Sony Xperia ZR and Sony Xperia ZL. This Mid range phone from HTC scores high on looks and features and is expected to give good performance. There are various better options available in the mid range segments like Nexus 4, Huawei Ascend mate and Lenovo k900 which sport a larger screen size and better hardware specs. It will receive tough competition in this price segment in India where people prefer large screen devices and phablets. indian version of lg g pro does not support LTE or 4G we have already checked for the same. sir can u tel me the current os version of desire 601 becuz i read that it is upgradable to kitkat…is that available in indian version? and i have plan to buy this model is it fine?